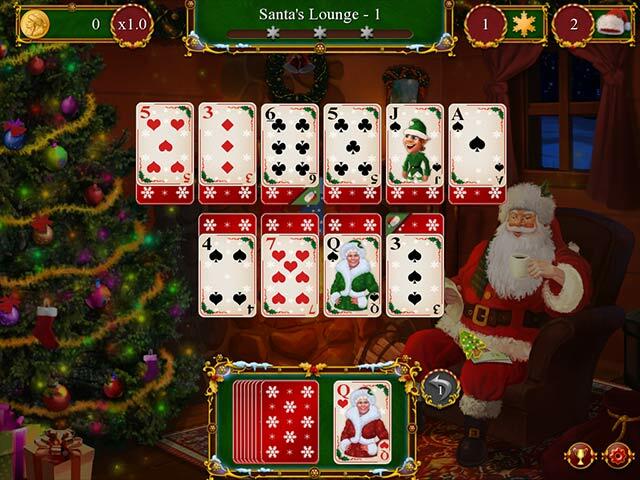 Help Santa solve a mystery in this festive and story driven solitaire game. Visit many locations around the North Pole and Santa’s Village. Visit the Christmas Store where you can purchase items to help you on your travels. Collect Santa hats to complete levels and earn Santa coins along the way. 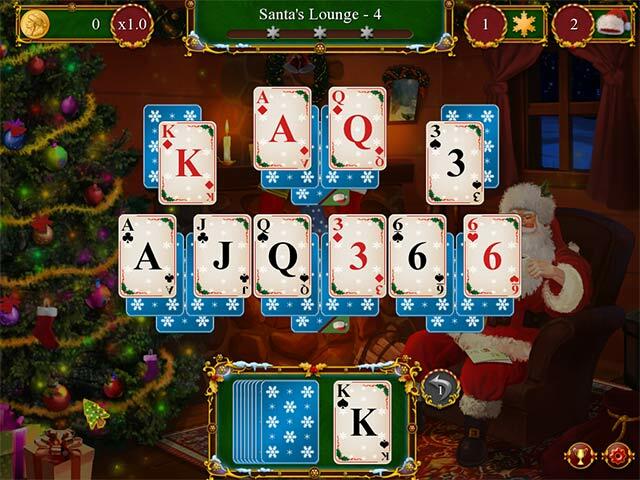 Santa's Christmas Solitaire is rated 4.6 out of 5 by 25. Rated 5 out of 5 by chevyqueen from My favorite solitaire game ever! What more can I say? I love this game. I have played it at least four times since it came out. I just played it this past Christmas. I am not sure if I can wait until next season to play it again! Rated 5 out of 5 by covedon from Great Relaxing Game I'm not big on some solitaire games, but this one was so different and great. It has other puzzles as well, match 3, turning tiles for a picture etc. There's constant different Christmas music playing in the background which makes it even nicer. I really enjoyed this game. Rated 5 out of 5 by cyndrap from Way too much fun! This is a delight. Lots of assorted games in addition to straight solitaire play. Great Christmas / Santa game. I liked it had different play levels and difficulties and the assorted decks for the holidays, plus earn awards. I liked the various Christmas carols they were not repetitive and not irritating. Just right music for the holidays. Rated 5 out of 5 by maxbridge from Santa Delivers! Great Solitaire Game I love this game - colourful, easy scrolling, fast and smooth graphics. I like the challenge of getting the "hat" cards, sometimes you can do it, sometimes not. I have got to level 4 with all perfect scores, but many have had to be repeated a few times. The cash is generous and you can buy some super upgrades which definitely help to obtain that optimum 3 star and holly level . It's really fun - and I have a long way to go. Tutorial and stories can be skipped, but the stories themselves are relevant, and fun. Relaxing for all ages - I can definitely recommend this one! Rated 5 out of 5 by Bumbles2 from North Pole in chaos over mysterious disappearances !!! I loved every minute of this game. The story is quite cute !!! This is a VERY different kind of solitaire and its pleasantly easy...no frustration with this one !!! The music is amazing and well done...the graphics are incredible and the artists need a pat on the back for a job well done. Santa's reindeer have pulled a disappearing act or???? have they ????? In each level of this game... you play solitaire as a one up and one down...you earn money that you can spend in the store for power-ups and there are also mini-games !!! There is so many good things to say about this game and most of the reviews have explained it well !!! Merry Christmas everyone and may Peace and Good fortune be yours in 2018 !!! Rated 5 out of 5 by IsisRising from Great Christmas game Santa and the elves are very busy then run into a few problems. This is a really great game for Christmas. You have several themes for the cards themselves. You can control the volume of game sounds and music. I love the music that they have chosen so I turn the other sounds down. There are 3 gameplay modes which comes in handy. You can also turn the hints off if you prefer. There are several mini games which can be repetitive but they are fun. You also get a choice of 3 card mini games: TriPeaks, 5Peaks and Free Play. This game has a lot going for it so I can whole heartedly recommend it. Rated 5 out of 5 by sashasabre from Delightful! This game is visibly beautiful and has all of the fun factors: cute story line, music, mini games. One of the most entertaining solitaire games I've played! Rated 5 out of 5 by AwesumDude from Love This Christmas Solitaire I've bought solitaire games from this company before and the quality is always excellent. 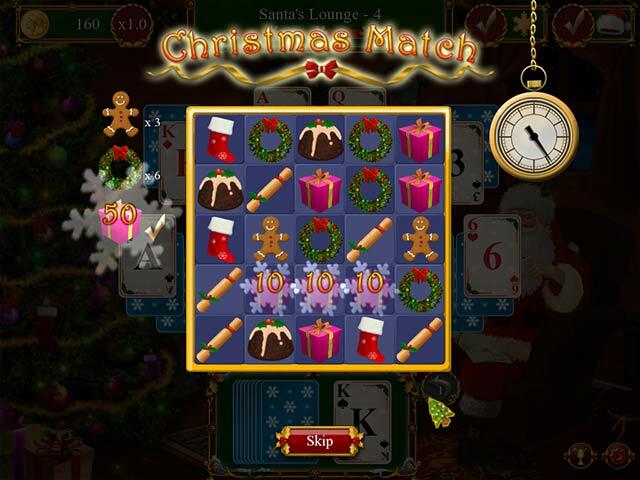 Graphics are great, Cards have Christmas characters and the music are familiar caroles. You can earn bonus power ups. You have a goal for each level.Unforunately, there is no indicator as to your progress. I played the demo and bought it. I highly recommend this one. Rated 5 out of 5 by afoster605 from Great Fun! To my surprise, I really enjoyed this game. Great graphics, wonderful music and good storyline. The pace is just right with power-ups that last and allow you to continue to build a high score and your cash level. You can make it as challenging as you like and you won't get frustrated with impossible to win levels. Interesting pop-up games that also keep the game fun and interesting. Different from any solitaire game I've played. I could play it over and over again. Would like to see more games from this developer. 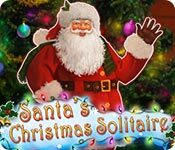 Make your way around the North Pole and discover clues to help you solve a mystery in this festive and story driven solitaire game.